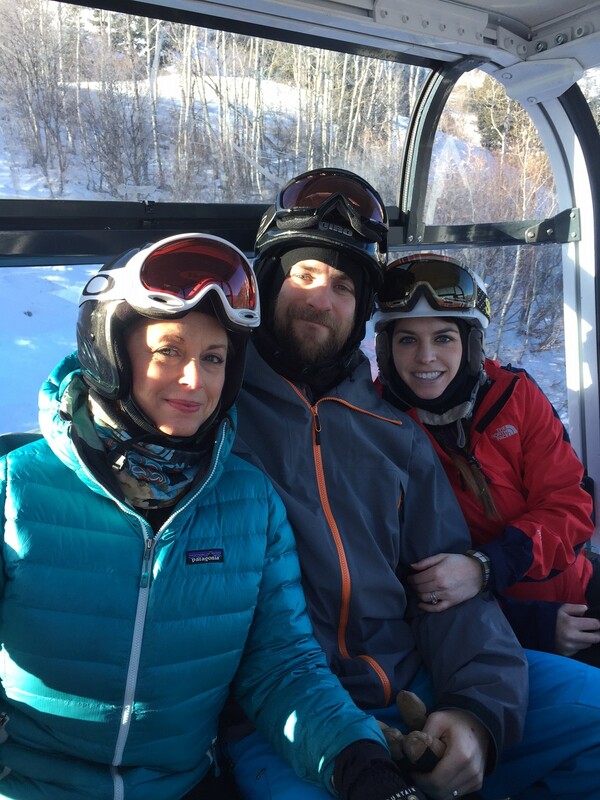 Going on a couples ski trip can be like playing mixed doubles with your spouse. Depending on a number of factors, it can either go real well or not so well similar to playing tennis with your spouse or significant other. 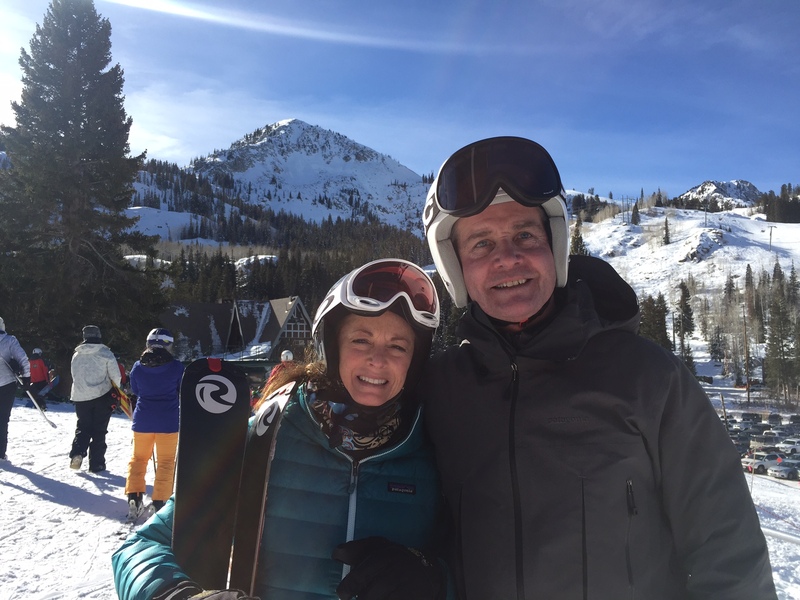 My wife Janet and I just got back from a great ski trip to Utah with our good friends Judy and Mike Smith who invited us to their new place in Park City. 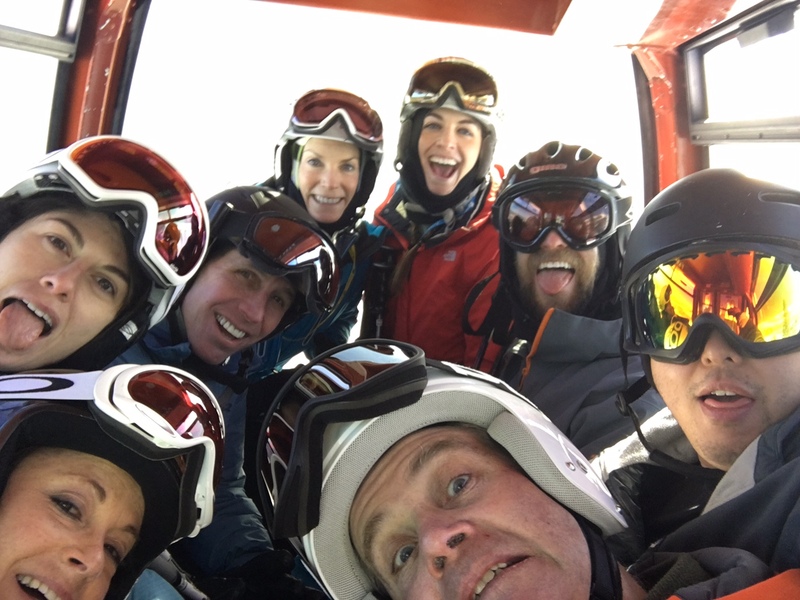 Along with their daughters and husband/boyfriend, we had an eclectic group of skiers enjoying the sunshine and amenities of Utah skiing. So to continue the tennis/skiing comparison, it started off a little bit on the wrong foot when early in the trip, I had Janet follow me down a slope at Snowbasin that was marked” thin cover”. This immediately raised a red flag to her and along with a whole bunch of skiers/snowboarders trying to pick their way through the section, she was terrified of the conditions and the array of traffic. I associated it with having her at the net in tennis and serving my first serve directly into the back of her head. Not a good start to say the least and like a bad start in mixed doubles, we had to sit down and regroup. Sipping water and relaxing in the lodge, we had a nice chat and Janet began to feel more comfortable knowing that I would definitely not take her down anything like that for the rest of the trip. We would ski groomers the rest of the time and she would follow me down allowing her to feel more comfortable and relaxed, knowing full well how well she skis in these types of conditions with sunshine and good visibility. Guys who bark directions at their spouses and significant others, oftentimes ruin a good match in tennis or skiing. This is why some people think it is a bad idea to play tennis or try to teach your wife the finer points of skiing. That is also why I make it my business to keep things light with Janet and make her comfortable so that she can perform at the level where she is capable. This is like allowing her to make her ground strokes and volleys in tennis with positive reinforcement rather than the pressure of constant instructions and telling her what she is doing wrong. This misguided instruction often alienates the spouse and can destroy any chance of togetherness on the court or slopes. Fortunately, the weather was cooperative and although the west is having a poor snow year, what was open at the resorts was groomed to perfection, allowing Janet and the group to ski without any concerns about thin cover, rocks and the like. Another factor in skiing or playing a game of tennis with your spouse is the dynamics of the group that is involved. Our group was fun and all of them can ski/ride well. But we all stuck together and no one pressured anyone to ski something beyond their limits. When you have optimal conditions like good snow, sunshine, and comradery, things go quite well and the competitiveness is at a minimum. Similar to a fun round of mixed doubles with friends. No more whacks to the back of the head with a serve or a smashed overhead intimidating someone from the other side of the net. People perform well when they are relaxed. 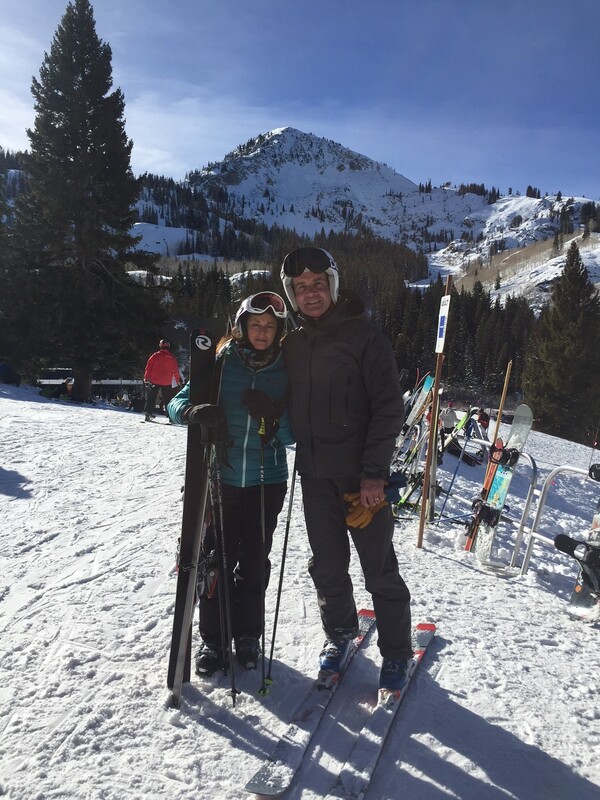 My wife is a good skier with well schooled skills and it is important for me to keep her in the game. I like skiing with her along with our friends and I keep the inconveniences to a minimum. I have a huge backback in which I carry our boots and helmets and I take her skis wherever we have to walk and only ask her to take our poles. I am like a Sherpa and we all laugh. Not that Janet could not do it herself, but if I can make it as convenient as possible, she will enjoy it better. She also has a bum shoulder which I take into consideration and I don’t ask her to lift anything. It comes with the territory of being an ex flight attendant. Too many bags in the overhead. The final tennis comparison would be when Janet follows me down the hill, it is like me hitting the ball deep in the corners with a firm ground stroke and allowing her to hit a crisp volley at the net when the opponent struggles to make the return. When I put her in a situation where she can be successful, she excels, and like a perfect volley, or ground stroke, she feels empowered, and enjoys the day all the better. So, lesson being here guys and gals, if you want to have a good time with your spouse or significant other in any endeavor- patience, kindness, and skill development in an environment that is not intimidating is key. Also, the fun factor. Make it fun. This is not a job. I have had to learn these lessons sometimes the hard way but I am getting much better. Thanks for reading and think snow. This entry was posted in Friendship, Inspiration, marriage, outdoor activities, outdoor sports, Outdoors, recreation, Skiing, Winter, winter sports and tagged Park City Mountain Resort, Snowbasin Ski Area. Thanks there Shark. You are definitely in this mind set with how kind and patient you are with your students. Also you and Tina are a great boarding couple. Best blog ever! What about me! Jan Lee is smiling now ! You always win best spouse, person, Instructor and friend. St Paddy, you make all adventures fun and smiley. Thanks for being our friend and ps. Jan Lee is a great skier. 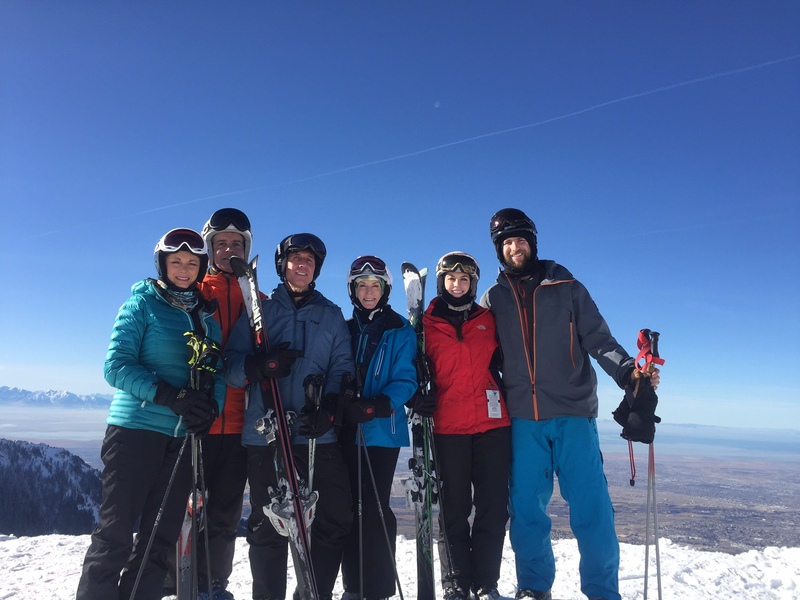 Love the McCloskey’s and plan to continue ski bike hike trip for many years to come. Amen to that Judy and thanks to you and Mike for making it fun and always including us . We love you. Thanks dear and I always love to have you as a “mixed doubles” partner. My son skied Park City Jan 12 with 25 friends from Tampa. He asked me to tune up his skis before he left. He gave me a full 7 minutes notice. I pick up a new file at Walmart and a box of paraffin. Sandi’s iron was sacrificed. The old man still had the touch, and no blood shed. He reports to me that his skis are the fastest and he is leading the group. I passed the baton to Mike a few years back at Snowshoe. Seeing his videos gave me a thrill. Our little Cooper Louise is now 3-3/4 years old. Talk is for me to take her skiing perhaps as soon as Feb-March this year. The joy of teaching her would be tremendous. I just watched video of teaching my daughter Christine in 1986. Hey to Mike Smith from Cincinnati Ohio. Mike, remember the Seven Springs 7 foot race? You drove like a bat out of hell to the hospital with me in the back and the gal who collapsed at the end of the race. That was scary! Hey to all my old friends reading Pat’s blog. Pat told me about the blog about a month back. I then proceeded to invest the rest of my afternoon reading it. It brought back many fine memories and smiles! Think Snow! Thanks for the reply Tom. This Mike Smith is actually a physician from Philadelphia. The Mike Smith to which you refer is the owner of a marina up in Lake George now. He and I get together also every season to ski Whiteface and Gore. I will be with him on February 4-7. I will give him your regards. Thanks for reading Tom and get that little gal skiing. The sport of a lifetime. Hutch- it was fun. Jan did well. Judy howled at the finless. Great advice, good read, thanks. We head to Wyoming and Montana the end of the month for 2 weeks. Hope to ski a lot of different areas where the super senior rates are extremely reasonable. Hitting some big areas too. I believe the snow there is good this year. Safe Travel Rus. Enjoy those great skiing states. Great job Janet, and awesome post Pat! Not the best season for a new pair of skis out here. Hoping for improvement Art. See you in March. Thanks for reading.